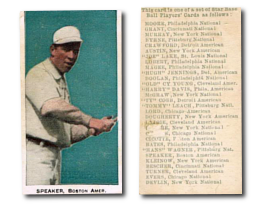 The 1911 Close Candy E94 Baseball Card Set is a rare issue that consists of 30 different players, The E94 Close Candy cards, each measuring 1½" by 2¾", are very similar to the other candy issues of the era. The players likeness is set against a colorful background, with cards issued in several different colors for each player. The E94 cards contain a checklist on the back, which also may contain many possible "overprinted" advertisements for one of the George Close Candy Company products. Examples include: Blome's Chocolates, A Base Hit!, Oh You Fan!, Your Safe!, Your Out!, Home Run!, Three Strikes, Pennant Winners, Oppie Dildock, among others. The multiple color backgrounds on each of the card fronts, the many possible overprints on the card backs, give the 1911 Close Candy set an exponential number of possible variations. These many combinations, combined with their scarcity, make an E94 Close Candy master set nearly impossible to collect. The key hall-of-famers included in the 1911 E94 Close Candy set are: Honus Wagner, Ty Cobb, Frank Chance, Sam Crawford, Johnny Evers, Nap Lajoie, John McGraw, Tris Speaker and Cy Young. CLICK HERE if you want to sell your 1911 E94 Close Candy Baseball Cards.